The site started as a small number of very plain HTML pages and has grown into a sophisticated site with a large amount of easily-navigated content. 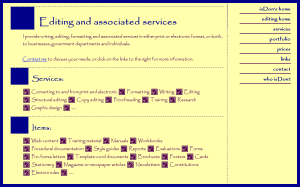 Maintaining a file structure consisting of several hundred files in a variety of formats: HTML, PDF, CSS, images, Word and Excel. Managing the content of the site, including editing, formatting and updating. Converting the Commission's printed publications into both HTML and PDF files. Liaising with Commission staff, departmental and central government technical staff, site hosts. Ensuring compliance with accessibility guidelines, HTML standards and Government website requirements. 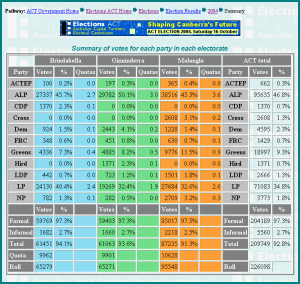 For the 2004 ACT election, I designed, developed and implemented the election results system, which displayed a variety of tables and statistics to the tally room, internet and media. This was a high-pressure system, due to the highly public exposure and having only one chance to get it right - it had to work on polling night. 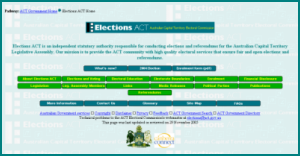 The ACT Electoral Commission leads the country in technological innovation and was one of the first jurisdictions in Australia to use an electronic tally board. Data entry of polling booth results into a MSSQL database with a Microsoft Access front-end. Continuously updated output projected into the tally room. Live regular feeds to the media. Automatic creation, using PHP, of around 300 static HTML pages and CSV files for the Internet, updated every 60 seconds. Used after the results were finalised to publish the official statistics for the election. 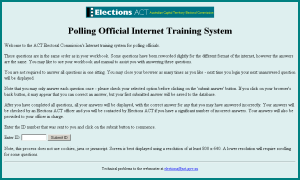 I designed, developed and implemented the first ever Polling Official Internet Training System (POITS), which was very favourably received by users. The problem: to improve polling official training. Polling officials have traditionally been required to read a manual and complete a home workbook in preparation for their polling duties, with the completed workbook to be presented to the Officer in Charge (OIC) when they turn up for work on polling day. The period leading up to and shortly after the booth opening is one of the most hectic times for the OIC, so he or she is not able to check the workbooks before the polling official commences duty. Ideally the workbooks would be returned to the office before polling day, however the large number of books to be checked would require considerable resources. The solution: to enable polling staff to complete their workbooks online. The system was deliberately kept simple. Most of the existing questions were already multiple-choice, others were reworked to become multiple-choice, so that all answers could be checked automatically. User _ids and passwords were posted with their manuals to polling officials who then completed their exercises in a secure area of the Commission's website. Users were not required to answer all questions in one sitting, they could close their browsers and come back to where they left off. The result: better-trained officials who were able to provide a higher level of service to the voters. It was also interesting to see where people were making common errors, indicating areas to focus on in future. I helped design, develop and implement an Internet self-help system for clubs and organisations to run their own elections. This system provides all the resources required to run a free and fair election, using either single-member or multi-member elections. It includes explanations of different voting systems, model rules, sample ballot papers and scrutiny sheets for completion either electronically or by hand. 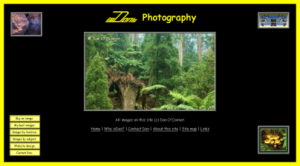 The purpose of this site is essentially to display my images and demonstrate my web site design capabilities. I've deliberately used different designs for the different areas of the site, mainly to demonstrate that I can use a range of styles. Your website does not stand alone from the rest of your business, it should be an integral part of it. I have a range of experience that helps me to tie your website into your organisation. Databases and websites go hand-in-hand. 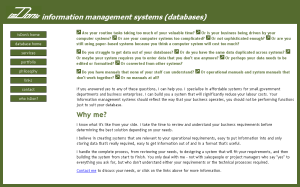 I can build you a database-driven website, or a database system to manage your information resources or operational procedures. 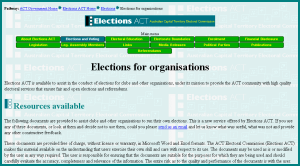 I was the database and IT applications administrator, manager, programmer and developer for the ACT Electoral Commission from 1997 to 2004. I designed, developed and maintained the election management system (TIGER) - a series of linked Microsoft Access databases, which covered all aspects of election management as well as the Commission's administrative functions. I can assist you with the creation and development of a range of publications for your needs, either electronic or print, or both. I can train your staff to effectively manage your site, or even to design and build your site from scratch. Or perhaps your staff require training in other IT systems, or operational procedures. I've had twenty years experience with training staff. I have a range of management experience, enabling me to effectively manage your website upgrade for you. Finance and administration manager for the ACT Electoral Commission from 1997 to 2001, where I managed a budget of $2.5m in the election years. Staff management, including recruiting, training and supervising casual, temporary and permanent staff. Project management, including managing non-Parliamentary elections, managing various projects for parliamentary elections, a number of IT projects and a range of operational projects.